On his days off, Lt. Michael F. Lynch, a firefighter at Ladder Company 4 in Manhattan, loved to play with toy dinosaurs with his elder son, Michael, 3. They would line them up by type and take them for "far walks" — a game in which the dinosaurs foraged for food and water. "He was an unbelievable dad," said his wife, Denise. She said he would come home from a 24-hour shift and see their other son, John Ryan, known as Jack, and say how "shocked he was at how much Jack had grown." Jack is 1 year old today. His nieces and nephews called Lieutenant Lynch, 33, who was 6 feet 5 inches and 230 pounds, Big Mike. The firefighters in Ladder 4 called him Prancer, a nickname given him the night he thought he heard a bell and started jumping around the firehouse looking for it. Mrs. Lynch called him "drop-dead gorgeous." 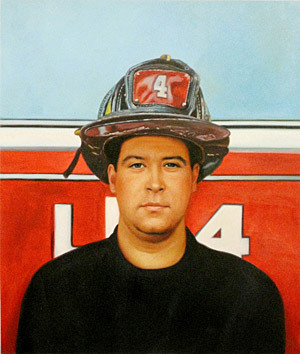 Lieutenant Lynch was last seen on Sept. 11 helping people trapped in an elevator in the lobby of 2 World Trade Center. Mrs. Lynch hopes to meet someone from that elevator because she is certain that its occupants survived. She said, "Those people were in good hands with my husband."